This works really well with pork gigot or shoulder chops as they have more fat running through them and can stand up a bit more to the whack from the dry spice rub I use. As far as the Cous Cous is concerned I always cook using chicken stock – it adds more flavour to an essentially bland plate filler. But there needs to be a balance and that’s where the Tzatiki comes in. First make the spice rub by combining all the dry mix, the rub all over the pork. Leave for at least 1hr, don’t leave to much longer as you don’t want to pickle the meat, remember it still needs to taste of pork not just spices. After marinating for 1 hr get the pork under a really hot grill to start cooking. Now combine yogurt, cucumber, garlic and the lemon juice to make the Tzatiki – you can finish this with a lug of olive oil. These types of sauces/mezes/dips etc, etc are all your own personal preference – if you want more garlic or less cucumber then regulate it yourself,your the boss. 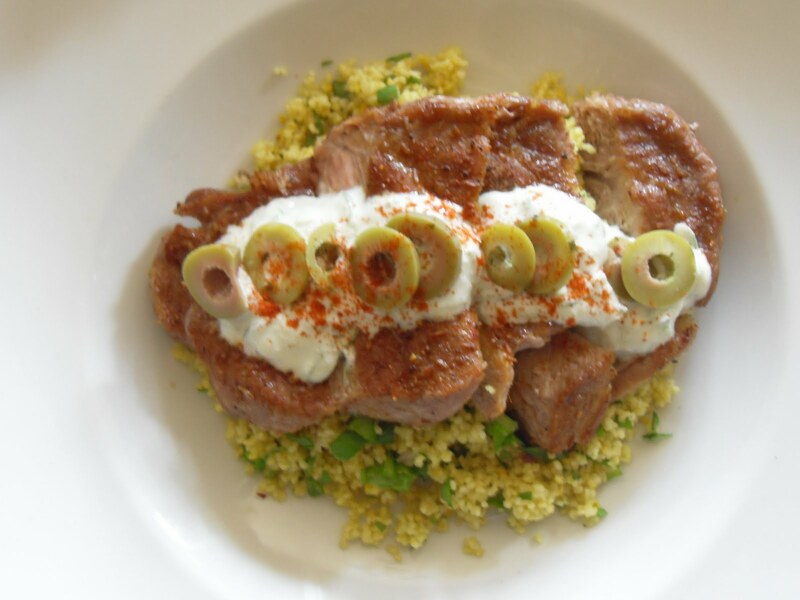 Cous Cous in a deep bowl, cover with the hot chicken stock, stick a plate on top and leave standing for 5-7minutes – then fluff with a fork and bop in the sliced spring onion. By this stage the pork should be grilled on both sides to your liking – you can eat pork pink by the way (note: pink, not raw). Job done, plate up (the pic above is how I do it) dress and with the Tzatiki (olives optional) – this is good with Flat Bread. Next Post King Scallops with mates.